Jon Bon Jovi laughs off death hoax, tweets, "Heaven looks a lot like New Jersey"
GMA News Online reports that "right after he was rumored to have died, rocker Jon Bon Jovi immediately came out and proved that he was in fact, alive and well." 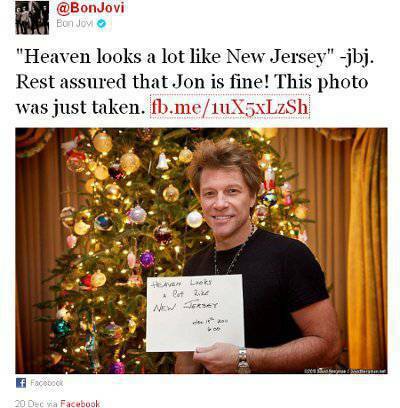 In the official Twitter account of the band Bon Jovi (@BonJovi), the band told fans: "Rest assured that Jon is fine." Jon Bon Jovi’s proof of life (photo posted on the band’s official Facebook and Twitter pages). On Tuesday, December 20, a photo of the band’s singer was posted. In it, Bon Jovi held up a makeshift sign that said: "Heaven looks a lot like New Jersey." It’s worth noting that the death hoax continues to be the most prevalent online "scam." As of this writing, nobody knows who started the rumor about Bon Jovi’s death. Some pundits claim that the hoax gained momentum on Twitter.